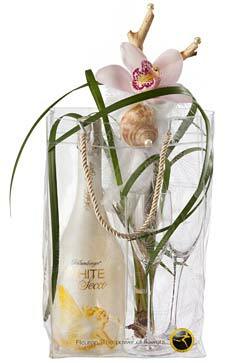 Want to surprise your mother with lovingly created decorations and show her how much you appreciate her? Click on our headlines and get to work. It's often little things that go straight to the heart. A lovingly prepared breakfast, for example, with all the things your mother is partial to. Table decoration is essential. 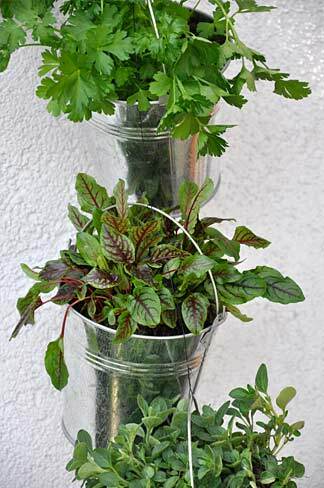 Here's a tip for clever little arrangements that are so easy to do that even children can make them. Materials: Tartlet-shaped or small heart-shaped baking moulds; floral sponge; flowers; possibly satin or felt ribbon and decorative wire. 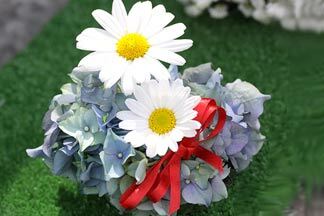 Method: Fill the moulds with floral sponge soaked in water and insert Mum's favourite flowers (or others); if you want, make a little bow and fix it among the flowers with wire. 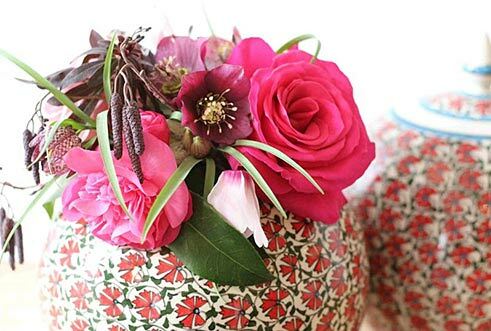 Tip: Don't use too many different kinds of flowers, two are enough (otherwise the effect is too busy). 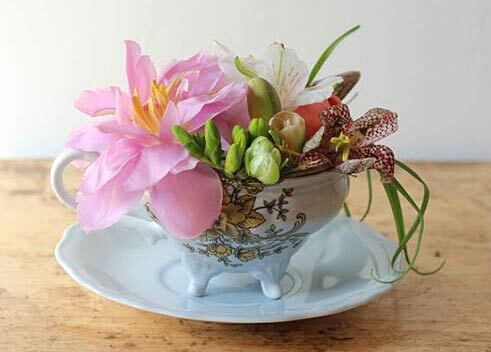 And after cutting off the ends, push the flowers deep into the water-soaked sponge so that they get enough to drink. Do you prefer "strokes" made by professionals? Find them HERE. Sometimes it's enough to brighten up home-made or purchased muffins. Our tip, suitable even for toddlers, will make your mother a queen. Materials: Home-made or purchased muffins; marzipan; heart-shaped biscuit cutters; possibly satin ribbon. 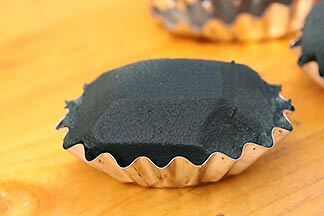 Method: First of all, we gave our muffin a little cap by grating green marzipan over it. 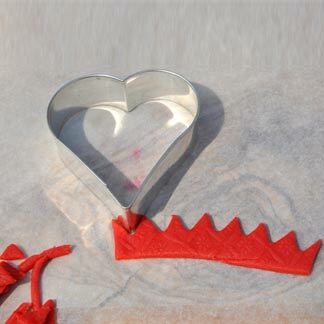 For the crown, we rolled out red marzipan, cut out a 3 cm wide strip and stamped out the points of the crown with the pointed end of the heart-shaped cutter. All you need to do then is to put this strip together to form a crown and squeeze the two ends of the marzipan together gently. 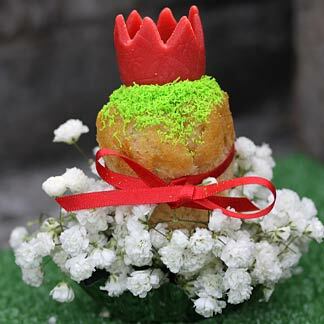 It's best to fix the crown to the muffin with a little egg white. 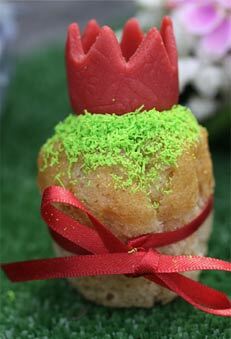 Finally, a satin ribbon that matches the crown can be tied round the muffin, to finish off an impressive treat! Romantic cups with little birds, dainty plates with butterflies … maybe even with a gold rim! 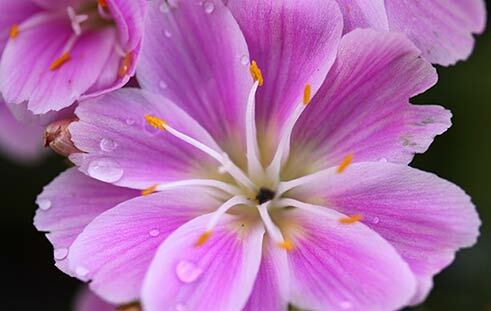 Good-quality, old china will experience a revival with the loveliest late spring flowers. This summer-heralding idea isn't just easy on the eye. It's also pure nostalgia because it brings back memories. 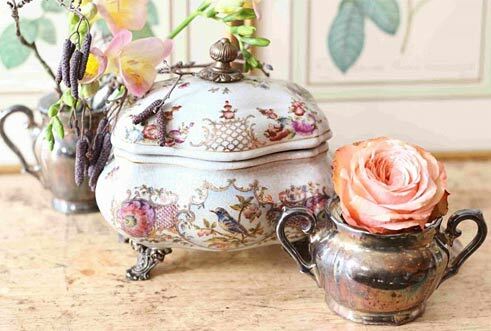 Materials: Romantic china such as cups, cream-jugs, sugar basin, soup tureen, etc. ; floral sponge; moss; flowers. 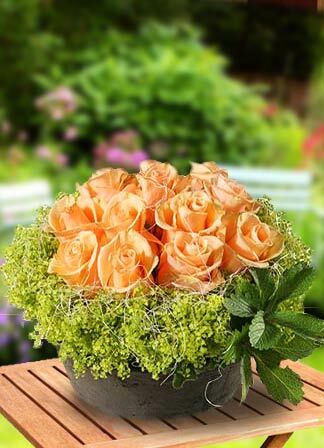 Method: Fill the china with floral sponge soaked in water and cover the sponge with moss. Old china is normally patterned, so when inserting flowers into the bed of moss, make sure the colour harmonises with the pattern. 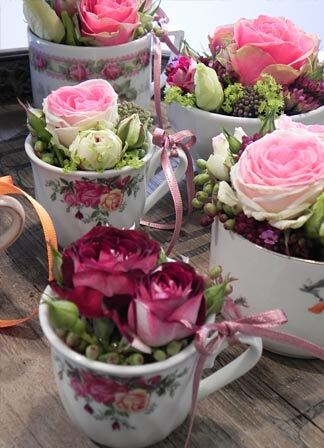 Tip:If you arrange several cups, sugar basins, etc., in a row, it's best to fill them all with the same flowers, otherwise the effect of the decoration is too busy. If you can't find any pieces at home that bring back memories or if you're afraid to use valuable heirlooms, you may find something similar in a "Brockenhaus" second-hand shop. That's an excursion your children (and grandchildren) are bound to look forward to! You can also find something romantic HERE. The crispiest tarts, the best risotto, the most imaginative dishes: Mums are often wonderful cooks! 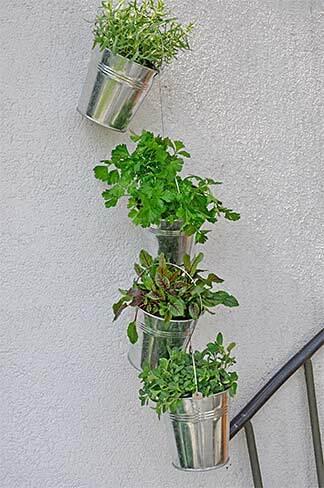 In that case, a little herb garden for the kitchen or balcony would probably be appreciated. It doesn't take long to make one. 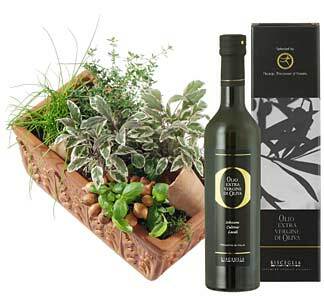 Materials: VA variety of herbs; little tin pails with handles, bigger than the herb pots; hydroculture balls; soil; wire. Method: Put an approx. 2 cm layer of hydroculture balls and some soil in the tin pails and place the herb pots in them. 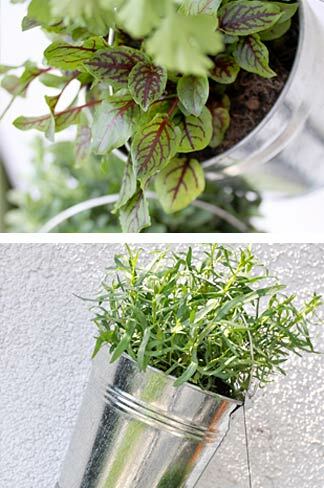 Then fill the space between the herb pot and the tin pail with soil, taking care to leave 2-3 cm free below the top edge of the herb pot. That makes sure you will have enough room to water the pails, which will be hung up at an angle later. Now tie the tin pails together with wire and hang the whole arrangement up. Tip: JDepending on the weight of the individual pails, you may have to use a double strand of wire. 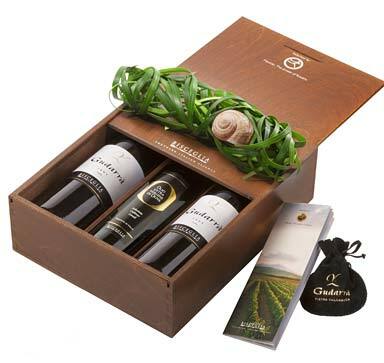 There are more imaginative gifts for multitasking mothers HERE. 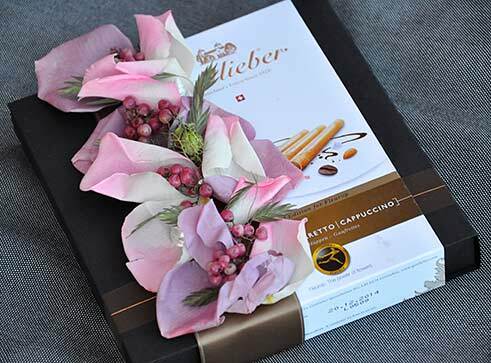 A box of chocolates, the finest Gottlieber Hüppen or delicious cocoa almonds: sweet treats are doubly welcome when decorated with lovely, fresh flowers. What's more, the best of all mothers will realise immediately how much love there is behind this gift. 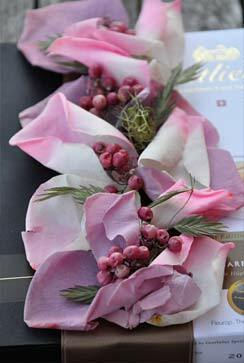 Materials: Rose blossoms; red pepper; SuperDots (double-sided adhesive pads); hot glue. Method: Wrap the gift attractively. 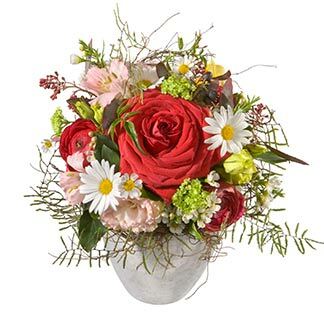 Attach the rose blossoms to it with SuperDots and apply the red pepper with hot glue. Surprises with flowers are also to be found HERE. 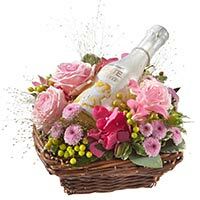 Apart from flowers, of course, our survey about Mother's Day surprises shows how important an especially lovingly prepared family breakfast is. So here's a recipe for a flower cake from Swissmilk.ch that not only tastes delicious but is also a feast for the eyes. 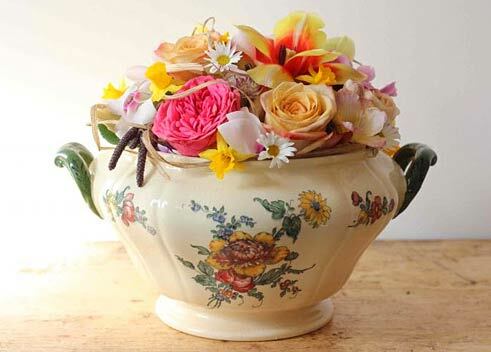 Ingredients: 1 new flower pot, 16 cm in diameter; greaseproof paper for the baking sheet; flower-shaped cutters 3-5 cm in diameter; pieces of florist's wire of various lengths; clarified butter; 500 g flower; 1 tsp salt; 100 g sugar; 30 g yeast, crumbled; 300 ml milk; 100 g butter, melted and cooled; 3 egg yolks; 3 egg whites, whisked until stiff; 40 g flour; 100 g sultanas; 1 egg white; 1 tbsp lemon juice; 225 g icing sugar; a few drops of different food dyes; coloured sugar balls, nonpareils, etc. 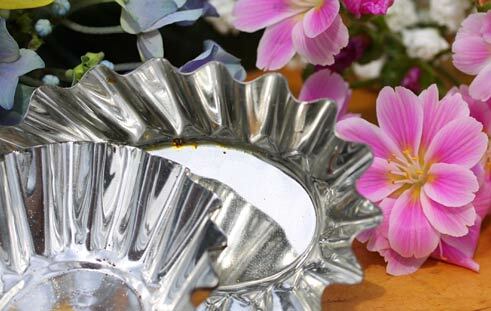 Thoroughly wash the flower pot, allow it to dry completely and grease well with clarified butter. 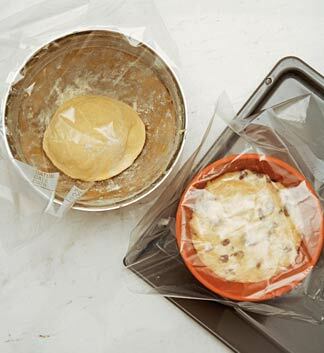 Place the pot on a baking sheet, put in a cold oven and bake at 220 °C for 30 minutes. Switch off the oven and allow the pot to cool with the oven door closed. For the batter/dough: mix the flour, salt and sugar and make a hollow. 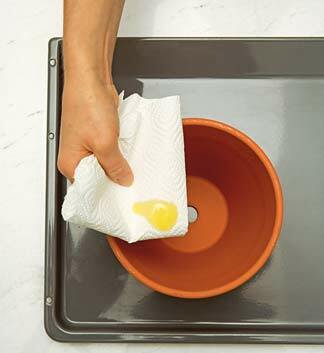 Dissolve the yeast in a little milk, pour it into the hollow with the remaining milk, butter, egg yolk and whisked egg white. 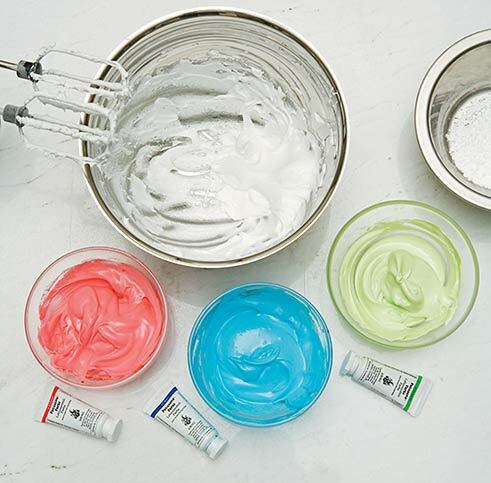 Mix this batter well and beat until bubbles form. Knead one quarter of the batter with flour to form a stiff dough. 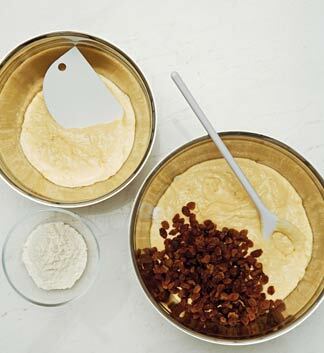 Add the sultanas to the batter and mix. 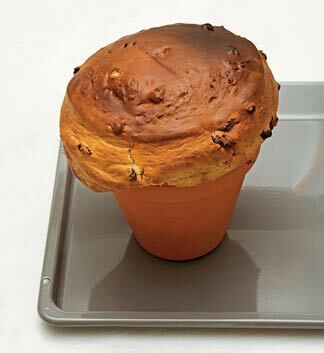 Pour the batter into the greased flower pot, cover and allow to rise to just below the edge of the pot. Cover the dough and allow to rise until double in size. 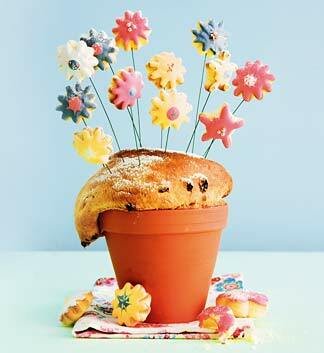 Pre-heat the oven to 200 °C and bake the batter in the flower pot on a low shelf for 35-45 minutes. Roll out the dough on a little flour to a thickness of 3-4 mm. 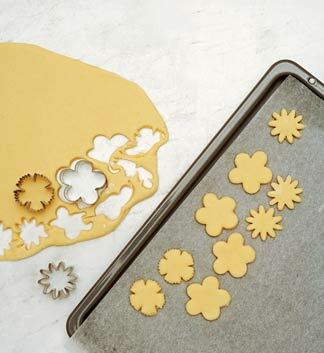 Cut out flowers (around 30), place them on a baking sheet lined with greaseproof paper, making sure they are sufficiently well spaced. Bake on the middle shelf of the oven at 200 °C for 7-9 minutes. Allow to cool. Beat the egg white and lemon juice with the whisk attachment of an electric hand mixer. Gradually add the icing sugar. Beat the mixture until firm and shiny with soft peaks forming (4-5 minutes). Divide the glaze into quarters. Colour 3 parts with the food dyes and dilute with a little water so that they are easy to spread. 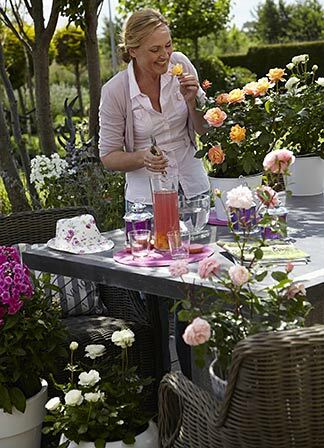 Spread the glazes on the flowers with a brush. 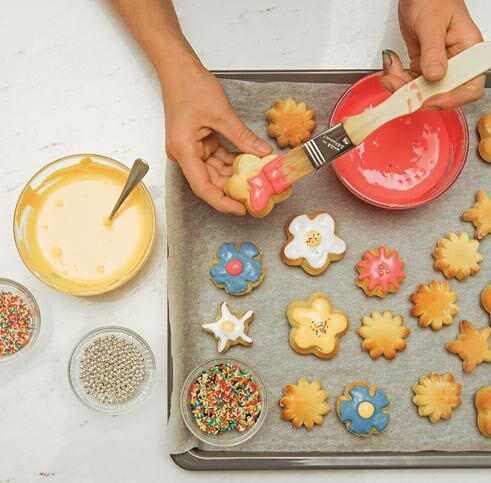 Place the sugar balls and nonpareils on the soft glaze and allow to dry. Dust the cake with icing sugar. 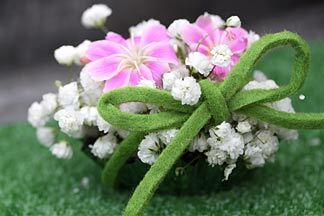 Place one flower biscuit on each of the pieces of wire and insert them into the flower-pot cake. As there will be more flower biscuits than are needed to decorate the cake, the remainder can be arranged around the cake on a pretty plate.